here is my equipment list. If you want to see pictures, you can click on the link at the bottom. Mapleshade Threaded Heaveyfeet (x8), brass anti-vibration replacement spiked speaker feet ($350.00) and Shunyata Research Inc. Powersnakes (x2), Venon PowerCable replacement powercords ($200.00). The room is approximately 24 x 23 feet with vaulted ceilings and approximately 150 (12"x12" and corner pieces) sound proofing panels to minimize perpendicular surfaces and distortion. Worked pretty hard on the room,.. but it's never finished. I'm changing the component racks next week and moving some things around. Will post more pics at that time! 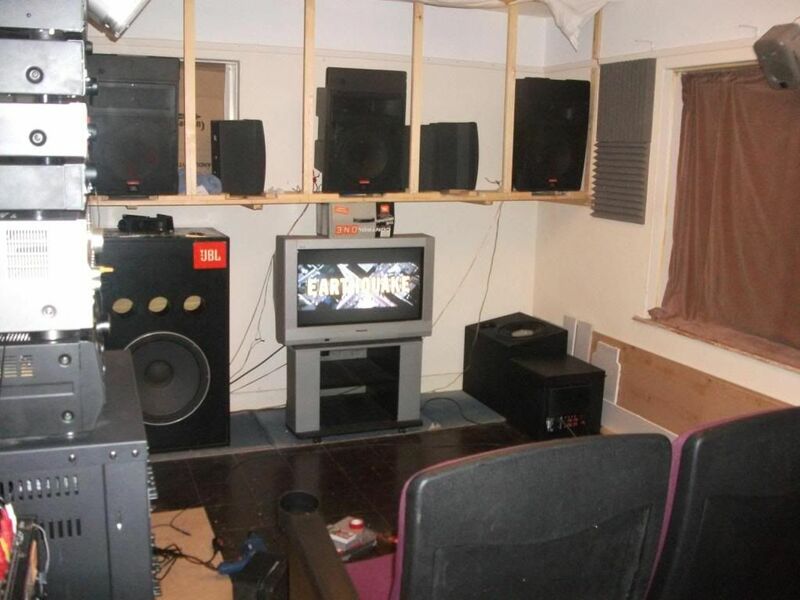 I would pay money to watch/listen to ALIENS in that room at high volume !!! Any future equipment additions in the planning stages....? Next time your in the southeastern New Hampshire area give me a buzz... I think a demo can be arranged for a fellow lddb member! I can't say I can compete with such an equipment set! First I need a place to live (left my apt in Singapore in February, still looking for a job/place). Then I need to get all my stuff stored in Singapore delivered/unpacked somewhere else. Great setup. I love how all the panels are metal. Very cool! Very cool. Must be a real headache to transport all that stuff every time you have to move. Not to mention your LD collection which I'm sure is substantial. I hope some other people post their setups as well, love to see what people are watching their LD's on. Very nice pics all round. Julien, how much did your HLD-X9 cost you in Akihabara? here's a version of the new setup I've since changed my room around and probably post new pics during fall break since I'm at school. awesome LD collection. I think I posted comments on your collection even before lddb had a forum! Man, I would love to watch some of those boxed sets on my 150" projection screen! Thanks for the invite invenio ! Very Heartwarming ! I can hear those Aliens screaming now ! Julien once you establish a nest we would like pic's of the new arrangement !!! I got the new racks setup. The CLD-97 is sitting on the bottom right. Damn! You have one more piece than I do. Guess I need to buy something. haha Great set up. It never seems to end does it? But as for getting "one more item". I have to warn you, I have my power conditioner and big Conrad Johnson Amp on the floor on stands... so I guess you better go ahead and by a couple of Laserdisc players,... just to be safe! Chimney breast to left of room is sound challenge as I have to work off the chimney breast and make the remaining last front of the room appear to be one large wall. Double glaze window might as well be paper which needs to be blocked up with x2 layers of MDF at different levels to reduce as much traffic sound as possible. Acoustical tiles are fitted at different angles on side and rear wall and a few on the ceiling near to the front. Yamaha DSP-100 disconnected and presently set aside now. Harman-Kardon AVP1a Dolby pro-logic THX (used for auto balance of the Lt-Rt and serving as an extra, way of see if levels are too high before passing to Format 60 non-sync. Behringer GEQ3102 31 band 1/3 rear back duel centre mono surrounds as well as stereo rear back for Dolby-EX Dolby TrueHD surround 7.1 and dts-ES 6.1 7.1 when used. Dolby CP45 currently being used for the surrounds as EX on Dolby-Logic additional 6channel input still planing on what to use it for with the surrounds? Sony Bravia LCD 30" flat screen HD ready for bedroom. Thou Might think of using it for the living room. Fine picture not great just fine displays a bit more width then my CRT Panasonic. JBL control 5 (x5 inactive at present time), I’m thinking for a new role in the sound system for them to play in. JBL x 3 Control 12SR the forth one sits at the back of the room) LCR modified to run as separate LF / HF with the Beringer DCX2496 x4 only x3 are used for LCR at present looking for two more for 5-screen matrix for special film showings with Dolby Stereo CP65 or CP500. The Puck sub bass transducers fitted to x3 seats the remaining, The Puck I'll buy later and several more as they're not all that bad for the price if kept within their technical tolerance range. I’m slowly putting 19” pro audio racks together that has started with x1 and has now gone very slow but I’ll get there, no rush. A past picture and I'll take a new current up-todate picture in short whille. Last edited by laserbite34 on 14 Oct 2013, 21:46, edited 5 times in total. The Yamaha RX-V650 (7.1 input RCA only) seems to work well with the Sony BDP-S550 for dts hd master audio and WONDERFUL for DOLBY TrueHD the true cinema format of the past 40 years. Some other views of the cinema rocker seats and they do make it feel like cinema. From an existing cineam for a cheap price per seat! This is only for short while the timber will not be used thou some parts of it might, "waste not want not"
There is usually a perceived balance between audio volume and visual area size. People tend to put the volume higher when the screen size goes up, without realizing they are listening at a higher volume at all. It just "feels more natural". I'll get myself some theater chairs someday ... If I ever get to live in the same place more than 2 years.